Carlisle audiences were spooked and blown away by our immersive work #HiddenSpaces that featured performers aged 6 – 79 years from all walks of life. An intensive two-week long summer project culminated in a series of immersive theatre performances beneath Carlisle Railway Station. Our production team worked behind the scenes lifting equipment, sweeping never ending rubble, assessing risks and liaising with station staff leading to a smooth running process with fantastic results! We are extremely grateful to our sponsors for allowing this to happen. Created in collaboration with choreographer Adam Russell (Living History, 2015), Virgin Trains, University of Cumbria and funded by the Arts Council England. MUSIC: Simone Spagnolo created an evocative score and immersive soundscapes that complemented the atmosphere and themes of the production. 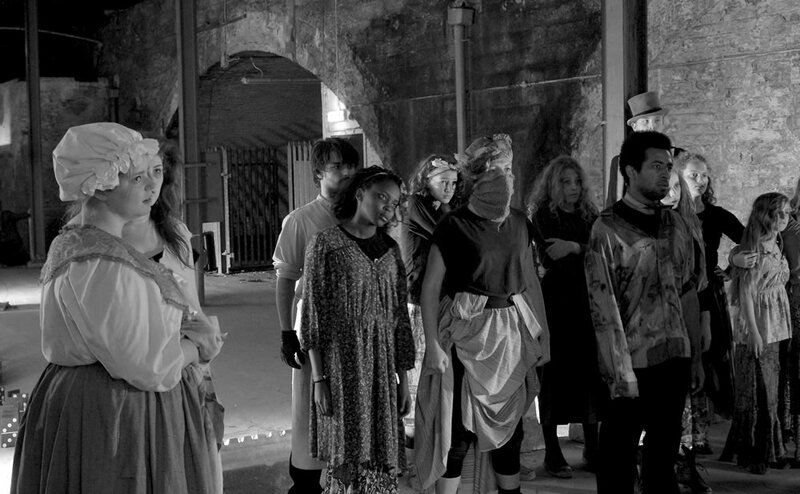 All this whilst Adam Russell and Zoë Leigh Gadd worked with the performers on their creative expression and intention to build layers of detail that made this an event to transport audiences to the dark history beneath the train tracks. Dance Ahead’s #HiddenSpaces15 is a piece of immersive, entertaining theatre that brims with originality and excitement. Its aim is to transform audience members from witnesses to participants. Existing as more than a vehicle for observation, immersive theatre presents the opportunity for the audience to be complicit in the narrative and actions of the characters. The relationship then between the audience and the performers isn’t the traditional power imbalance intrinsic in most western theatre. Instead the bond is one of co-dependency, and collaboration. Dance Ahead’s #HiddenSpaces15 understands the potential of this type of theatre and capitalises on it. It is ineffective to discuss the subject matter of #HiddenSpaces15 in terms of a linear narrative. This piece of theatre devised and overseen by Dance Ahead founder Zoë Leigh Gadd it seems is deliberately constructed to work outside of the expected. In fact a great deal of this works’ power lies in its commitment to originality. Instead of visualising the narrative of #HiddenSpaces15 as a path made up of a flowing progression of plot to a definite conclusion, the journey in this piece is one comprised of stepping stones; there is an order but it is deliberately disconnected. A series of stories and perspectives combine in this piece to create a wonderfully incandescent disorientation. The tone of this piece is made palpably clear from the moment that the audience meet their hosts, those who will guide them through the labyrinthine environment of the eponymous ‘hidden space’ used in this piece, the Undercroft of Carlisle Railway Station. The audience is split into two groups and taken on two separate routes around the space. This has the affect of heightening the level of engagement felt by the audience, creating an atmosphere in which there is no anonymity. The hosts are integral, they serve the practical purpose of ushering the audience through the performance space whilst also adding coherence to the narrative. They are a physical and narrative link between the vignettes. Their importance cannot be overstated. Both hosts were great to watch, the perfect mix of unpleasant and likeable, of humorous and horrific. The characterisation and delivery of the hosts greatly added to the character of this production and encapsulated the entire tone of #HiddenSpaces15; entertaining, eccentric, unique and unsettling. As the title would suggest a major entity in this piece are the spaces in which the action takes place. Not just a performance venue, the locations used serve as inspiration for the action, shaping the events that transpire within them. Location is almost anthropomorphised, demonstrating its own unique voice. One of the locations brought to life is a demonic café, in which dwell its amiable yet repugnant owners. There is an atmosphere of fun and menace in the café scene. The audience are invited to sit, dance, converse and drink. Music composed by Simone Spagnolo and dance choreographed by Adam Russell work in conjunction to generate a superb moment that feels almost timeless. The combination of smells, sounds, effective lighting and hard spirits demand engagement on a multisensory level. Another space explored is an old Butcher’s Shop that seemed to serve as a cannibalistic meat emporium. The Butcher and his Wife were horrific creations that were terrifying yet enjoyable to interact with. I was struck by the atmosphere created in this area, praise must be given for the lighting and sound used they augmented the action and greatly enhanced the effectiveness of this moment. Outside of these spaces could be found a selection of other characters including a selection of young children and a group of frenzied washing women who brought to mind the now dormant textile industry formerly synonymous with Carlisle. The conclusion of #HiddenSpaces15 takes place in a vast cavernous space atmospherically lit. In this scene the entire roster of characters come together in what seems like some kind of resolution, or at least a catharsis. This scene was the most effective use of music and dance. Simone Spagnolo’s score was evocative and well suited to this piece. In Spagnolo’s music there was a chugging machine like urgency that reverberated around the space, making great use of the expansive acoustics in the Undercroft. 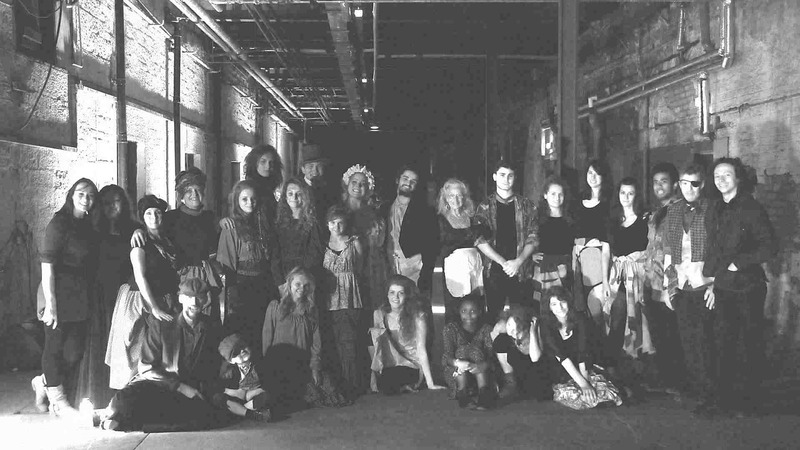 Adam Russell’s choreography in this scene was emotive and encouraged the audience to connect with the characters and their situations. This scene was well placed at the end of the production as it rounded off the experience with a climactic flair. Engaging with #HiddenSpaces15 is like being taken to a dreamlike realm where one feels at the same time alien and yet simultaneously welcome. Dance Ahead brought a historically sympathetic approach to this production, using well-researched costumes, and furnishings. The synthesis of anachronistic locations and modern-day story telling with the seamless blending of dance, drama, music and the occasional ‘tot o’ gin’ resulted in a thoroughly entertaining and provoking experience; that I hope will be the first of many more to come.